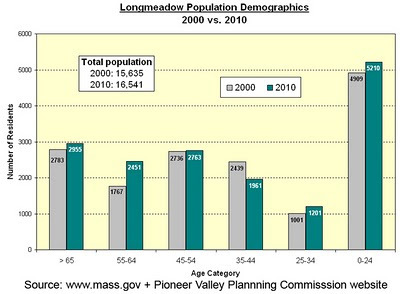 According to the 2010 Longmeadow census, there are a total of 5,406 town residents over the age of 55 and a large segment (2,763) between the ages of 45-54. Our town has an aging population (like most towns) and the need for senior services and facilities is likely to increase not decrease over the next 10 years. In the same way as it is possible to predict the school age population for future years, the demographics of our aging population can be estimated using some basic assumptions. 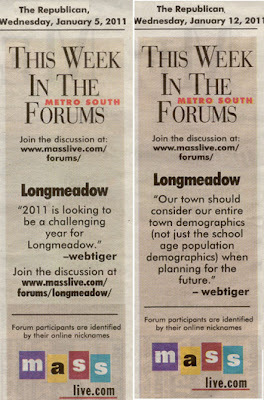 Our town should consider our entire town demographics (not just the school age population) when planning for the future. 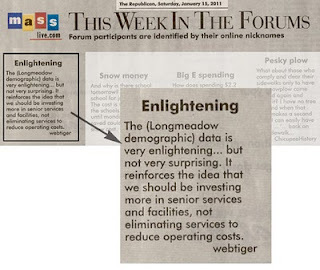 The above data shows that an estimated 48% of Longmeadow taxpayers are over 55 (assuming that most of the 0-24 segment are not likely to be taxpayers). 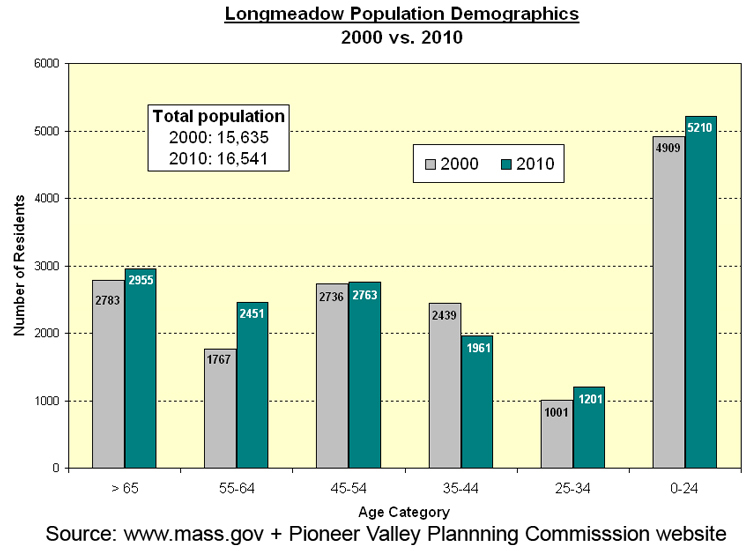 There is also a large segment of the current Longmeadow population that is between 45-54 and within the next ten years will likely significantly increase the percentage of our population that is over 55 years of age. Between 2000 and 2010 there was a significant decrease in the number of residents in the 25-44 age group. (3,440 --> 3,162) while the number of school aged residents has increased (4,909 --> 5,210). 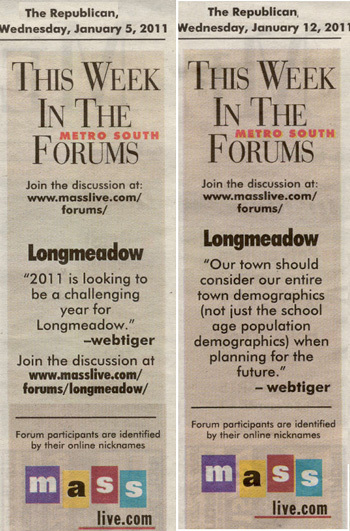 Towns including East Longmeadow, West Springfield, Chicopee, Westfield, Springfield, Palmer, Agawam, Granby, Holyoke and others have built new facilities, renovated or updated existing facilities or are considering new facilities for their senior services. They have recognized the need and are doing something about it. 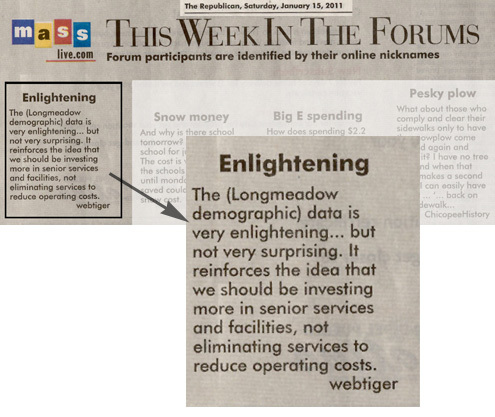 The Longmeadow Select Board should not consider actions in the coming budget cycle that will reduce senior services in order to cut town government expenses. Longmeadow should increase the commitment to senior services and include a major renovation or new facility for our seniors in our long range capital plan. Our town leaders should consider the needs for all town residents- not just the school age segment when planning for the future.